DUNSTABLE - Jeanne Marie (Hathaway) Mitchell, age 62, a resident of Dunstable, MA, beloved mother, wife, daughter, grandmother, sister, aunt, godmother and cherished friend to many passed away on Monday, August 27th, 2018 at the Community Hospice House in Merrimack, New Hampshire after a courageous battle with cancer. Jeanne passed peacefully in the presence of her loving family. Jeanne was born in Santa Monica, California on June 27, 1956 and raised in Beverly, MA by her mother, Yolanda Hathaway and father, the late Bradford Hathaway. Jeanne was educated in the Beverly school system and received her Bachelor of Science degree in Early Education from Salem State College. Jeanne had a zealous passion for living. She was the life of the party in whatever group she occupied, exercising her sharp wit and charisma to charm the world and put those around her at ease. She exuded a glowing light in every room she entered. Jeanne was a member of the Mount Pleasant Golf Club community. 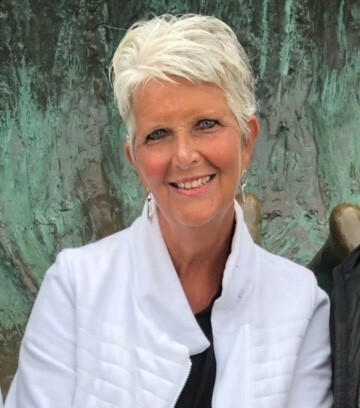 After a dedicated career as Director of Human Resources for the Groton-Dunstable Regional School District, she spent some well-deserved time on the green, traveling with friends and family, and being a wonderful "Nini" to her two grandchildren, Paige and Jonathan Lauro. P & J were the absolute light of Jeanne's life and she so adored them. Jeanne leaves behind her husband of 38 years, Paul F. Mitchell, her daughter, Amy L. Lauro of Nashua, NH, her grandchildren, Paige and Jonathan Lauro and her son Matthew W. Mitchell and his wife, Caitlyn Mitchell of Hudson, NH. In addition to her husband, children, grandchildren and mother, she leaves behind her sister Mary Ann Davis and her husband, Randy of Beverly, MA, her brother Brad Hathaway and his wife Denice, of Salisbury, MA, and her brother Wayne and his wife Cheryl, of Beverly, MA. Jeanne also leaves behind her mother-in-law Rose Mitchell, of Mattapoisett, MA, brother-in-law Billy Mitchell and his wife Kathy of Dunstable, MA, her brother-in-law Eddie Mitchell and his wife Connie, of Chelmsford, MA, her brother-in-law Rick Mitchell and his wife Sue, of Mattapoisett, MA, her sister-in-law Stephanie Mitchell of Mattapoisett, MA, and her sister-in-law Carol Loud of Wilmington, MA. Jeanne is also survived by her many nieces and nephews who loved their aunt dearly. Jeanne is preceded in death by her father, Bradford W. Hathaway, and her father-in-law, Edmund J. Mitchell. MITCHELL – Jeanne Marie (Hathaway) Mitchell. Visiting hours will be held at the TYNGSBOROUGH FUNERAL HOME, 4 Cassaway Dr., Tyngsborough, MA on Thursday, August 30th from 4 to 7 p.m. Her funeral will be held on Friday, August 31st at 10:00 a.m. at the TYNGSBOROUGH FUNERAL HOME. Burial will follow in the Dunstable Cemetery, Dunstable, MA. In lieu of flowers, the family suggests donations to the Community Hospice House, 210 Naticook Rd., Merrimack, N.H. 03054 in Jeanne’s name (www.hhhc.org). The family would like to thank the doctors and nurses at Massachusetts General Hospital, Emerson Hospital and Community Hospice House for their care and compassion. For directions or online condolences, please visit, www.tyngsboroughfuneralhome.com.